This article gives you a guide on how to create more complex patterns in the example of 4 on 4 off pattern. It will give you a step-by-step instruction on how to create such a pattern and can also be used as a guide to create other similar patterns. To find out how to get to the Patterns page and how do they generally work have a look at the introductory article Shift Patterns Overview. To start with, go to the Patterns page or Schedule calendar and click on Add Pattern. 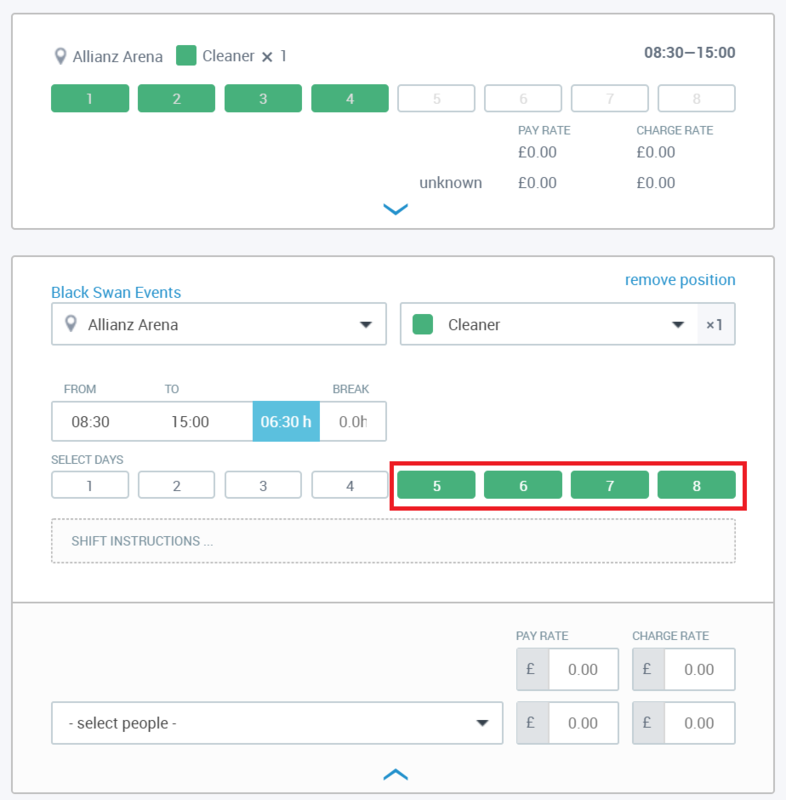 This will help to differentiate between patterns later and you can use it to search for shifts by Pattern Name on the Shifts List. To create a 4 on 4 off pattern you will need to choose the ON/OFF option from the Pattern Type dropdown. Next, choose the LENGTH of the pattern cycle in DAYS (how many days is one pattern cycle long). 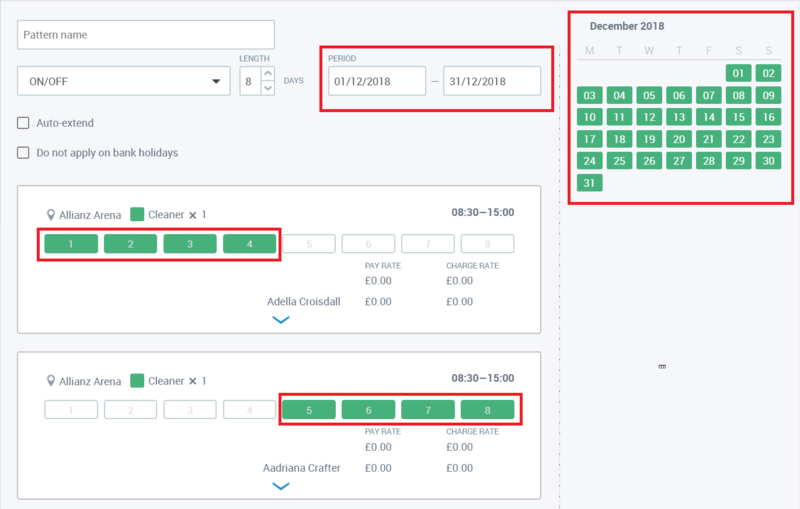 For a 4 on 4 off pattern you will need to set the days to 8 which means that there will be 4 days that the shifts are ON and 4 days when the shifts are OFF. 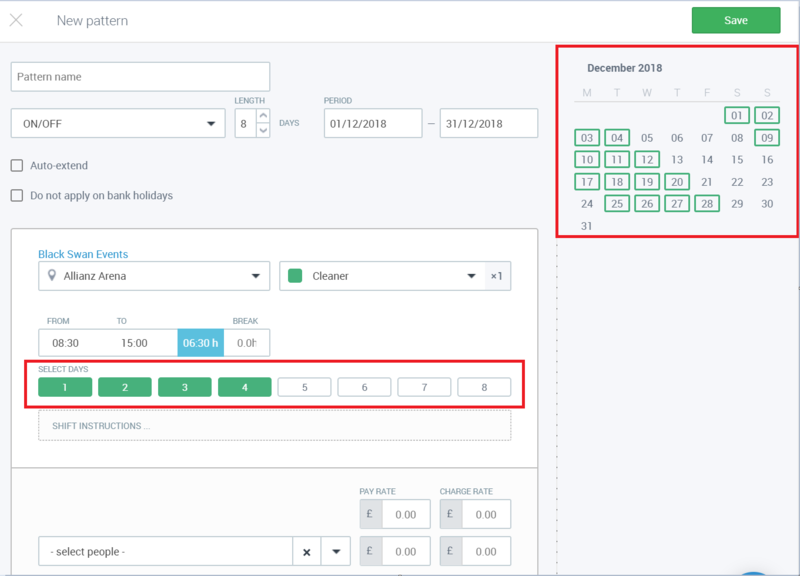 TIP - you will need to INCLUDE the OFF days to the pattern length when setting days. Once you have set the days to 8 you will see that 8 day boxes will appear to the Select Days section. After choosing the Pattern Type and Length you will need to fill in the information about Location, Position and Times. Next, Select the Days for the shifts by clicking on the Day Boxes. For a 4 on 4 off pattern click on the first 4 days. This means that the shifts are going to be created for those 4 days and the rest of the 4 days are the OFF days. 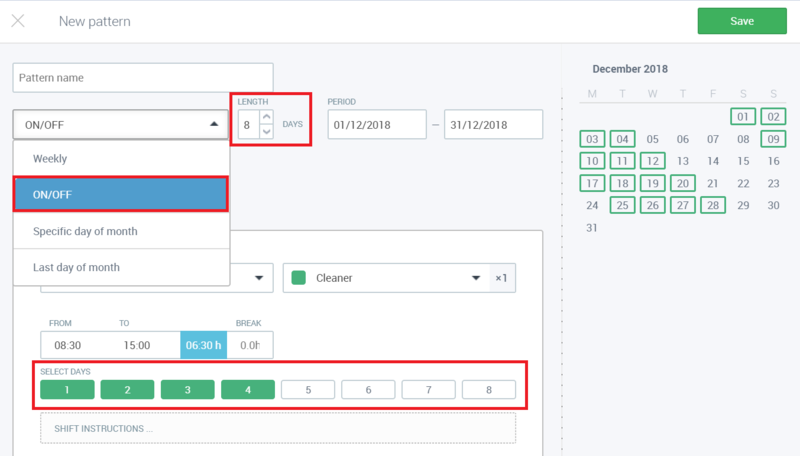 On the right a Calendar Preview will appear as you are creating the shifts so you can see how the pattern will look like over a period of time and if the shifts are on the dates that you need them to be. If you want to assign people to the pattern you can do this by clicking on 'Select people'. If you wish you can also create these shifts as open shifts and assign people later. If needed, you can allocate the 4 off days to another person if the location has shifts every day. This would then be a pattern where 4 days are allocated to one person and the other 4 days to another person Here is how to create such a pattern. 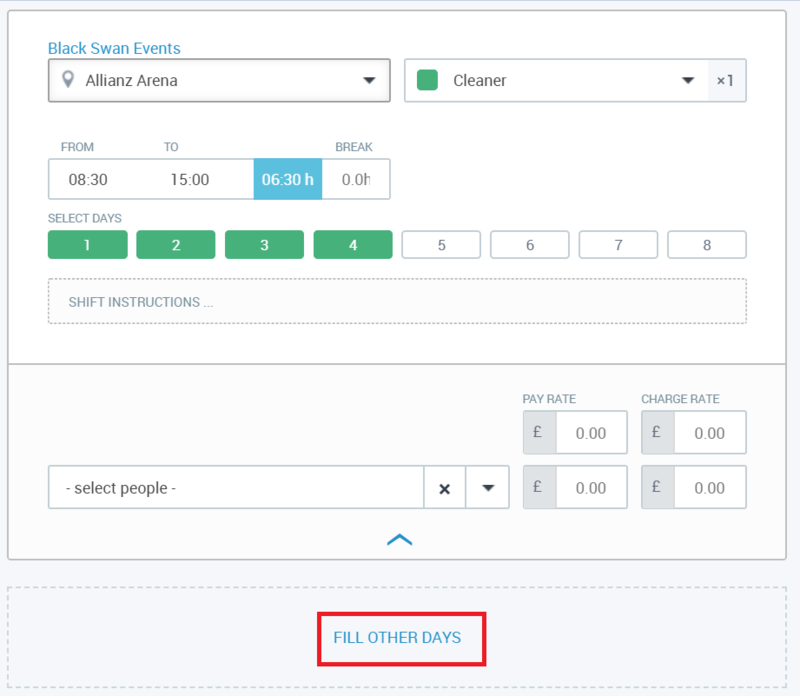 After you have created the pattern as explained above you will need to click on the 'Fill Other Days' option at the bottom of the pattern dialogue box. This will open up another position dialogue box with the same position details. You will then need to click on the OTHER 4 day boxes to add shifts for those days. Next, you can assign people to these 4 days or simply create the pattern as open shifts for now. Click on Save and the pattern is created! You can then view the position details, who is doing shifts on this pattern and can see on the Calendar Preview that the site has now shifts each day of the month. If you have any questions or would like to know more, please contact us via the blue button located at the right bottom corner and we will be happy to help you out!